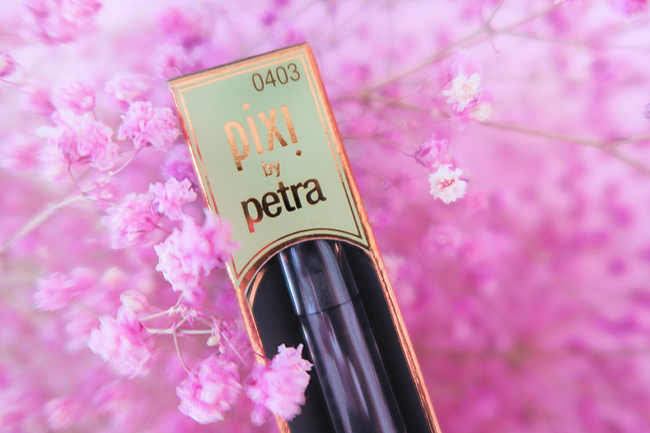 Many times I passed the Pixi store in Soho/London, adored the beautiful packaging of the products through the windows, but it's only now that I finally tried them on my own and can let you know my review. Thanks to Marionnaud, Pixi products are available in Switzerland for a while now. When makeup artist Petra Strand started her brand of youth-enhancing beauty products over 15 years ago, it was her aim to bring out the natural beauty in all women and created innovative formulations that are infused with botanicals and beneficial ingredients. Good to know: Pixi products are not tested on animals. 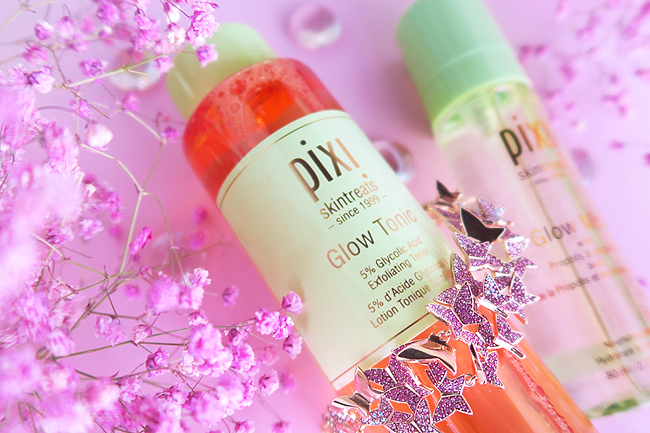 If you wanna try just one Pixi product, it must be the Pixi Glow Tonic! Called a beauty hero by the Vogue and being praised by many bloggers and customers, this has become a cult product. It's an exfoliating toner that helps to remove dead skin cells, leaves your skin with a healthy-looking glow and minimized pores. I've been using face tonics for years and think this one is a very good choice, gentle but soothing and with a wonderful smell. 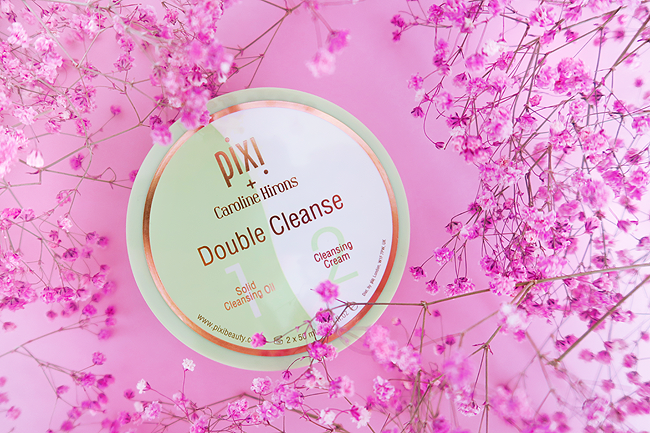 Another tip is the Pixi Double Cleanse: If you don't clean double yet, you have to start today and this powerful duo manages to remove even waterproof makeup. 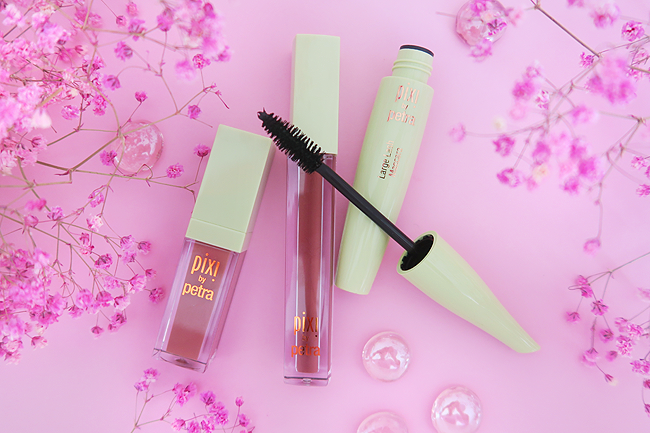 While with other brands you end up having two bottles, it's very handy that Pixi united both in one pot. The only negative thing I have to say is that it smells a little bit weird, almost like candle wax. Got tired dry skin? This mist is an instant refresh and hydrates the skin with argan oil and aloe vera. You can use it before applying makeup or during the day. I love to use it on my naked skin and feel like it really makes my skin glow. For me, it doesn't work so well on the makeup since it destroys the flawlessness of my foundation. A mascara which is supposed to make the lashes long and add volume. It's certainly a good quality one and the packaging is cute, but let's be honest: There are good mascaras and worse, but I am still looking for the ultimate lash blast that replaces lash extensions for real. I love matte lipsticks and this one with rosehip oil is a-m-a-z-i-n-g! It's easy to apply, long-lasting, nourishes the lips and feels comfortable on the lips. I need to buy one in a more flashy colour for sure! A volume-maximizing lip treatment with a lovely fresh mint flavour. You can wear it solo or as a plumping pre-treatment for lip colour or on top of any lip colour. I use mine as a base and top it with more colour.